On Sunday 7 October, Ella Thomas and Lisa Evans headed on an unforgettable trip to the battlefields of Belgium and France. This trip, fully funded by the Centenary Battlefields Project, gave the two pupils an opportunity to explore both the history and the literature of World War One. 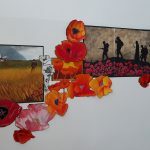 Following a specially designed programme, we heard readings from different novels, plays and poems to help us understand the impact of war and explore the theme of division and comradeship. Especially moving was the opportunity to stand in a natural trench which was used by the Lancaster fusiliers on the first day of the Somme; who an hour before their advance were captured waiting on camera. Additionally, the opportunity to explore a poem from the GCSE English literature anthology was extremely captivating. On the top of an exposed ridge, which was held by Wilfred Owen and his battalion, the poem Expose was read and analysed. The weather as a harsh and unforgivable enemy came to life before us. On our final day the two planned activities gave us the perfect opportunity to reflect and remember. Firstly visiting Tynecot cemetery, the biggest commonwealth cemetery in the world. As the sun rose across the cemetery we visited the memorial of a soldier who had lived on the high street in Coleshill and laid a poppy in memory of the sacrifice he gave. Following a group ceremony, where a wreath was laid on behalf of our group, we silently moved off to a production of Journey’s End. The production, staged in an old munitions store, was extremely moving in light of the things we had seen over the three days. A fitting conclusion to a memorable tour of the battlefields in France and Belgium. Returning to Smith’s Wood we wanted to have an impact on our community and help them to remember the sacrifices given. 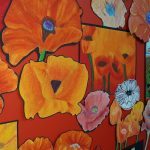 Inspired by the battlefields trip the pupils have delivered an assembly to every year group based on the British Legion Centenary Campaign, Thank You. During this assembly, all 1,200 pupils across the school have written a message to the WW1 generation thanking them for their contribution and sacrifice. 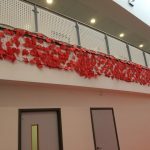 These ‘personalised poppies’ have been collated to form a memorial and ‘poppy wall’; reminding us all that although this generation may have gone, they will never be forgotten. 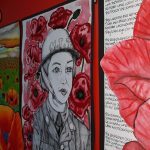 Year 11 Art students have also produced some outstanding work to remember the events of 100 years ago. Their stunning work is on display in our Reception.